The premise is intriguing enough— in Shanghai, young gay men and lesbians are willing to go through therapy, fake marriages, adoption clinics and thousands of dollars to honor and appease their mortified, hetero-loving parents. Inside the Chinese Closet follows two separate individuals, Andy, a self-ascribed bear in the gay scene, and Cherry, a woman who always knew she loved women. Most of the weighty but self-conscious conversations inexplicably occur over mealtimes here. Half the time we’re watching people eat as much as learning who they are. Perhaps food is what warms the otherwise perfunctory business-like conversations. Ironically the tension between the kids and their parents is juicier than any relationships with friends or lovers, as the film doesn’t really show what the older generation is fussing about. While it could be a potential love letter to the parents, it acquiesces a bit too much. Sadly, it’s not about the power of choice here but the power of parental authority… or the censors. In this trilogy spanning three decades during the Serbo-Croatian war, a dark gothic menace lurks throughout The High Sun even though the stories take place under the bright and blistering summer skies. This might be due largely to sultry Tihana Lazović, a Jennifer Jason Leigh-like badass, as well as the film’s effective backdrop of ethnic hatred. In each story, she plays Serbian femme fatales Jelena/Nataša/Marija to actor Goran Marcović’s Croatian boy-next-door Ivan/Ante /Luka. Their interconnected incarnations only add the feeling that not only are these two destined to find one another again in each successive story, but after each incarnation, the new relationship is a little more jaded than before. In the first drama, lovers Jelena and Ivan are too big for their Montagues vs. Capulets milieu. In the second, Nataša’s seething and curious desire for Ante is nearly predatory. The third develops even further— asking whether, after brokenness and desolation, the survival of love is even possible. Worth watching just to see Tihana Lazović get sunburnt. After returning home from their deployments, to stop the ongoing hellfire of war inside their heads, an average of 22 US vets commit suicide each day. Among the deepest wounds inflicted upon ex-combatants and hardest to treat, is moral injury. Iraqi vets Tom Voss and Anthony Anderson are no different. 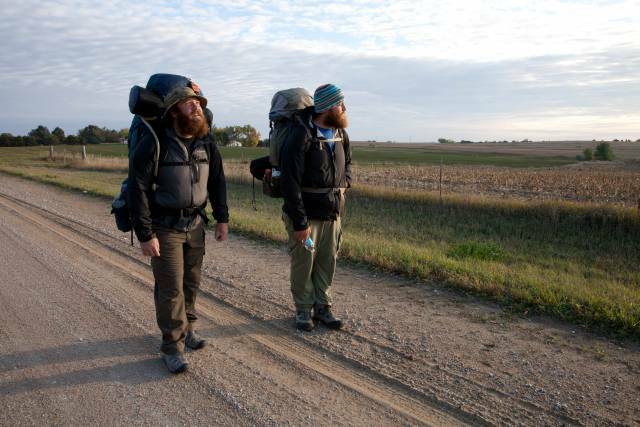 Taking a profound spiritual journey walking from Wisconsin to California was only the start of their path to bona-fide healing. Fortunately for us, filmmaker Michael Collins caught their transformation on-camera. It’s a jaw-dropping one— the kind of healing we often never imagine would be possible. Almost Sunrise is a standout film, showing cinema’s potential to effect social change… civilians included. Catching them at random junctures along their pilgrimage and listening to their partners share their own stories, one realizes this isn’t just a “veteran’s issue.” The effects of war continue to impact all of us, but rather than drag us through mind-numbing despair, the film opens a vista so we can calmly, clearly discover that we can indeed do something to help. For more information on the Human Rights Watch Film Festival click here. Just another opinionated urbanite relying way too much on her smartphone. Trying to reduce my carbon footprint by carrying my own bamboo utensils, thermos and expandable bag wherever i go, via public transport or just hoofing it. Happy movie-watching!